Chocolate. Creamy & Intense matched with crumbly roll. 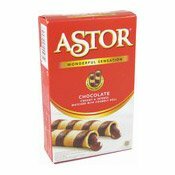 Astor is a chocolate wafer roll with sensational match between crumbly roll and intense chocolate. Ingredients: Sugar (37.4%), Wheat Flour, Vegetable Oil (Palm Oil, Antioxidant [E320]), Milk Powder, Cocoa Powder, Tapioca Flour, Cashew Nut, Maltodextrin, Emulsifier (E322), Colour (E150d), Salt, Vanillin, Raising Agent (E500). Simply enter your details below and we will send you an e-mail when “Chocolate Wafer Stick Rolls (朱古力卷)” is back in stock!